The information which follows is, as far as I can tell, unique in offering an insight into the use of ’Tiger Bells’ across several cultures in different continents, including shamanic usage. The author has kindly given permission for me to reproduce it here. Please go to the original website and contact the author for further information or if you wish to copy any of the information. Tiger bells are bronze jingle bells. Jingle bells are globularly shaped, hollow and have a pellet made of metal or stone inside which produces the sound when the bell is shaken. Tiger bells stand apart from other bells because of the peculiar design on the surface: a stylized tiger’s head. Very often the hoop is rectangular. 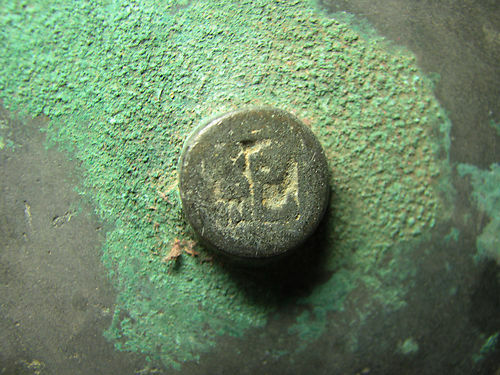 On the top half of the bell’s surface you often see one or two Chinese characters and some curls and curved lines, possibly floral motifs. Detailed information is on the pageVarious types. Bells with this design occur all over Asia, from Turkey and the Middle East toSiberia and Indonesia. They come in different sizes and there are variations in the design. The face, the tiger’s head, is however very consistent. That is why I have called these bells ‘tiger bells’. I noticed these bells for the first time in 1974, in Mindanao, Southern Philippines. They were in use by several ethnic groups, as dance bells and amulets. In 1975, in the Musée de l’Homme in Paris (France, now the Musée Quay Branly) I found several bells on a shaman’s costume from the Ewenk, an ethnic group in southern Siberia. These were almost identical to tiger bells I had seen inthe Philippines. I found this enormous distance between the two locations intriguing and decided to try to find out more about the history of these bells: how old they are, how they came to be where they are, where they were produced and where and how they are used. Not being an anthropologist, I had to start from scratch. I started this informal research in 1975. Since then I have found out a number of things. The most important finding is that some groups have bells with this design by the tens and hundreds while other groups within the same area, sometimes neighbours, do not have one single tiger bell. Examples are several minority groups in S.E. Mindanao and several Dayak groups in Kalimantan, This occurs in several places in East Asia and has led to the assumption that trade could not have been the only distribution factor. Trade is too indiscriminate to explain this obvious preferencewith some groups. It would be more likely that these groups already possessed tiger bells before they reached their present location. This could link those groups with the tiger bell and those without the tiger bell to the various migration waves in East Asia through time. It could also mean that tiger bells found with these groups are very old. 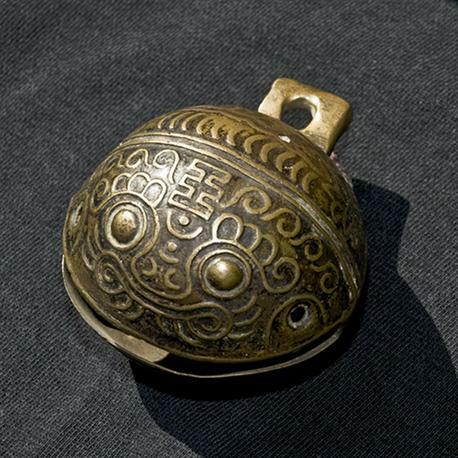 Another striking fact is that the bells with the tiger’s head design as we see it on the tiger bell from Mindanao, the Philippines, occur at the northern and southern extremes of the distribution area: Siberia, Mongolia and insular S.E. Asia. In between we find tiger bells of varying age, the majority possibly younger than those in northern Asia and S.E. Asia, and with many variations in shape, size and design, although all are clearly tiger bells. The tiger bells as we see them in Mindanao and Siberia have the most consistent and complete design; they are probably the oldest bells as well. Therefore I call this type of bell the ‘classic type’. The function of these classic tiger bells differs per group. They are used as an amulet by shamans from Kalimantan and Siberia. Other uses are: a necklace or a dance attribute. Other types are used as animal bells. The link with certain ethnic groups could indicate that the tiger bells are old. On the other hand, some of these bells are evidently newer than others. This indicates that these bells must have been produced in large numbers, over hundreds of years. In fact, they are still being produced. I have been told that there are at least several workshops that still produce tiger bells of different types: in Peking, in Dehra Dun (Northern India). There are also indications that tiger bells are still being produced in Taiwan and Mongolia. While we were collecting information in various museums and institutes, we found that although many people had seen all kinds of bronze bells, they had never recognized the tiger bells as being different from other pellet bells. Those who had noticed the particular design were satisfied with the observation that these bells were apparently of Chinese origin. Yet, the number of individual observations is vast and we now have reports of occurrence of tiger bells in the Philippines, Indonesia, Thailand, Malaysia, Vietnam, Laos,China, Korea, Singapore, Taiwan, Mongolia, Siberia, Tuva, Burma, Nepal, Bhutan,Tibet, Bangladesh, India, Northwest Pakistan, Afghanistan, Syria, Turkey and even Maltaand Russia. Also, we found that there are distinctly different types of tiger bells, and variations within these types. Since there is little literature on this subject and since I cannot visit all museums and libraries I have to rely for new facts on observations by others. All these years, travelling friends, colleagues and museum curators have helped. By presenting my search on the Internet I hope that I can reach more people and institutes. All relevant information on variations in shape, design, size, location, possible age, origin, ethnic groups, use, value, etc. is welcome. The more detailed, the better. Please mail your information, or your questions, to me. On every page you find a button Contact us. If you want to send pictures or anything other than text, let us know and we will give you another e-mail-address. That allows you to send photographs or video recordings of bells in use, etc. If your contribution is not free of cost, please let me know in advance. With your help we can try to find more solid facts to support the preliminary conclusion: that the presence of the tiger bells makes it possible to link ethnic groups to their movements over the Asian continent. Thus the tiger bells could become a migration tracer. Musicologically they belong to the group of jingle bells or crotal bells: they have a hollow, globularly shaped body in which a small pellet of metal or stone (hence the also often used term pellet bell) is held. 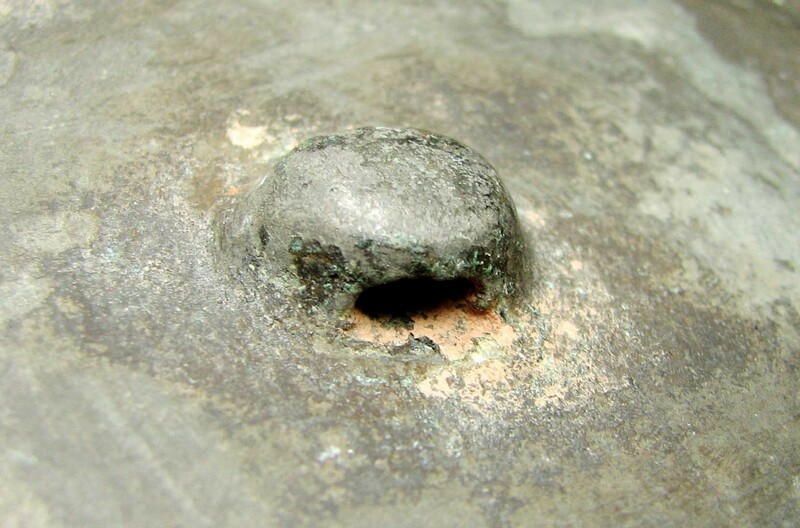 When the bell is shaken, the pellet hits the inside surface and thus the bells sounds. The bells have an opening, usually a split in the lower side of the body which lets the hollow body act as a resonator. The hoop for suspending the bell is very often square or rectangular, sometimes round, sometimes trapezium shaped. The characteristic that makes the tiger bells really stand out from other bells is the design. It is evidently a face with large eyes, a nose and a mouth or beak. Our first association was that of a frog’s head. Later, on a catalogue card of the Ethnological Museum in Leyden describing the bells on a baby carrier from the Kajan in Kalimantan, there is a quote from Prof. J J. M. de Groot saying that the face is a snake’s head. According to him the Chinese characters on the ‘forehead’ could meanThe Hing Company. He had seen these characters on the bells of the Lanun in The Philippines . On other bells with the face-design other characters appear. We find these characters on both sides, in the center of the top half of the bell. Very often these characters have been corrupted by the casting process or are just meaningless scribbles. Around the characters and around the eyes and nose we find curls and curves. On the ‘forehead’ there is a Chinese character , the character Wang. It means ‘emperor, royal’ and is usually found on Chinese representations of tiger’s heads such as this toy tiger. The tiger bells on the back of the shaman’s costume in the Musée de l’Homme in Paris (now Musée Quay Branly), France, were described as: Grelot; tête de tigre en laiton (transl.Crotal bells, tiger’s head, made of brass. For the full description: click here). ‘Hobo’, copper bells without tongues, suspended below the collar; like a crow’s egg in size and shape and having on the tipper part a drawing of a fish’s head (bold by author). They are tied to the leather straps or to the metal loops. Since the Wang character occurs since ancient times on bronze statues of tigers, such as the statue from the Chinese Chou-period (appr.500 B.C. ), and because the description of the bells in the Musée de l’Homme clearly mentions the tiger’s head, I decided to call these bells ‘tiger bells’ to distinguish them from other brass bells. But for reasons just as good they could be called fish bells, frog bells or snake bells. However since I introduced the term ‘tiger bell’ in my very first report in 1976, it is quite widely used and now occurs in many web pages (and even in a computer game although the bell in the game is not a tiger bell). Therefore I will continue to use the term ‘tiger bell’ until it is more correct to use another name. Tiger bells vary in shape, size and design. The majority of the bells belong to one of four type groups: type A, type B, type C and type D. Some variations exist. Those variations that are inspired by the tiger bell but miss on or more of the typical characteristics are grouped into the Alternatives. Alternatives are inspired by or resembling type A bells and type B bells. Type A tiger bells occur over a wide area and are used in many different ways, as a dance attribute (Pakistan, southern Philippines), as an amulet for adults, children and sometimes animals (goats and sheep in Afghanistan, cats with the Minangkabau in Sumatra, dogs inThailand (Akha), horses in Sumba and Malta). There is a strong link between tiger bells and shamanism. Shamans in Kalimantan, Sarawak, Mongolia, former Inner Mongolia and South Siberia have type A tiger bells in their costumes and paraphernalia (while shamans fromTibet and Nepal use type B and type C tiger bells). One shaman’s costume of the Solon(former Inner Mongolia) is decorated with over 60 type A tiger bells of various sizes. There are not very many records from mainland China. The examples known are mostly from the 19th century, and a belt, most likely from one of the ethnic minorities in China. In recent years new tiger bells are produced, sometimes copies of old type A tiger bells, sometimes variations inspired by the type A tiger bell. These bells are produced for trade to be sold to members of local Chinese communities and to tourists. So far they are reported in shops in Singapore, New York and Amsterdam. Type A tiger bells occur in many sizes, from about 2.5 cm. to about 4,5 to 5 cm. in width. Most larger type A tiger bells have a square or rectangular hoop. Smaller type A tiger bells can have square or reactangular hoops but also trapezium shaped and even round hoops (see the shaman’s belt from Kalimantan). 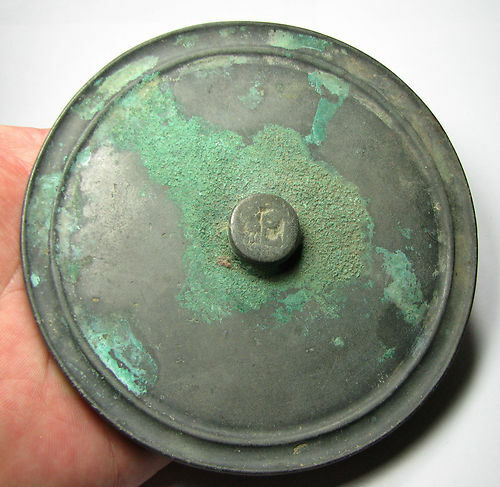 There is one report of a tiger bell from China (see below) with a width of more than 6 cm. Two bells, reported in China and in Korea are extremely large; these are however exceptions. Tiger bell with a width of 4,5 cm. Iban (Sarawak). One tiger bell, possibly from China, has a width of more than 6 cm. This is however an exeception. Several type A tiger bells are probably locally made with variations in the design (as inNepal, Syria and China). These variations could occur because the producer did not recognise the Chinese characters and considered them as meaningless, or possibly as floral motifs. Because of the whiskers, the face on the Syrian bell and on one of the Chinese bells bell looks more like a cat. Viewed from the side the height of the bell is smaller than its width. This sets them apart from the bells of type B and type C of which the height is larger than the width. Type B tiger bells are roughly the size of an chicken’s egg. The ‘Wang’ character on the ‘forehead’, so typical for the A type tiger bells, is missing. On the top half we can distinguish Chinese characters, sometimes one, sometimes two. The round character here means ‘long life’. The surrounding curls and curves are not always there. The hoop is always round. Tiger bells of type B bells occur by the hundreds. In Bangkok they can be bought in many handicraft and antique shops. They come ‘from the north’ but it is not clear what place or region that is. It is likely that these tiger bells are still produced. Type B tiger bells are used in many ways. In the Tibetan market in New Delhi (India) belts for yaks and horses with 10 to 12 of these bells were sold. One shopkeeper in Bangkok told me these bells were used as doorknobs. Nepalese and Tibetan shamans wear these bells on a chain across the chest as part of their costume. Type B bells of a smaller size are used as dog bells in Tibet and northern Thailand. These bells are large, with diameters varying from about 3.5 cm. to 4.5 cm. and heights from 3.7 cm. to 5 cm. or more. Type C bells have the shape of B bells but are smaller. On most bells we see the ‘Wang’ character, although sometimes corrupted. In general the eyes are more bulging than with the other types. 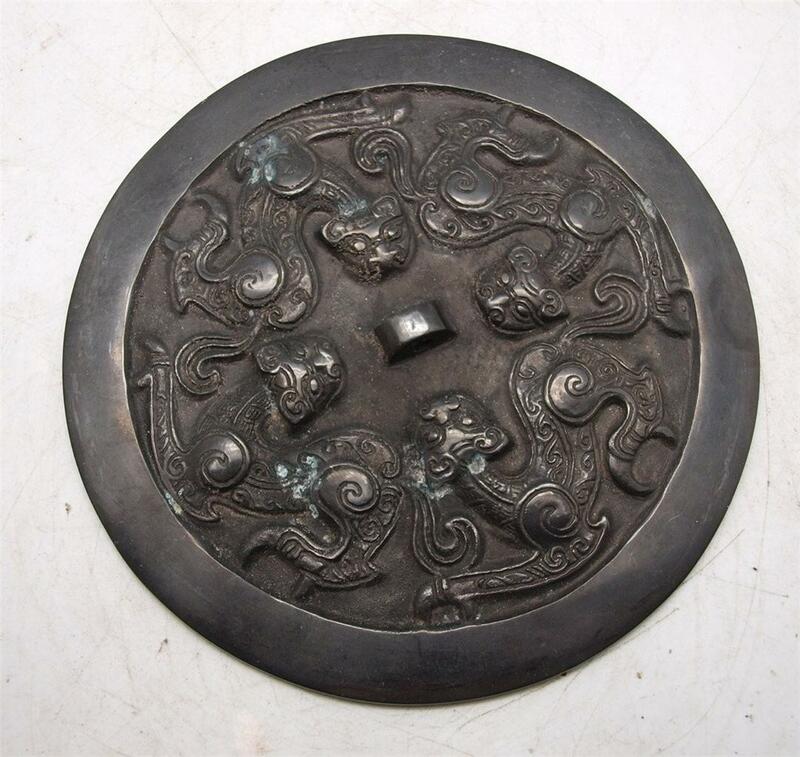 Also the relief of the design and the Chinese characters isthick and relatively high on the surface of the bell. The hoop is always rectangular with rounded corners. One handicraft shop owner in Kathmandu, Nepal, told me that bells of this type were being produced in a workshop in Dehra Dun (Uttar Pradesh, near the border with Himachal Pradesh). Many of these bells are sold as souvenirs in handicraft and ethnography shops. They occur in larger numbers on belts for horses and yaks. On chest chains worn by shamans they are sometimes found together with other bells. The size of the C type bells is rather consistent: a width of about 3.4 cm. and a height of about 3.8 cm. The lines could be inspired by two characters. The remains of a ‘Wang’ chartacter are in the centre of the picture. These are clearly two Chinese characters. Type D bells are more or less similar to smaller type A bells. The ‘Wang’ character is missing and the design is less detailed. 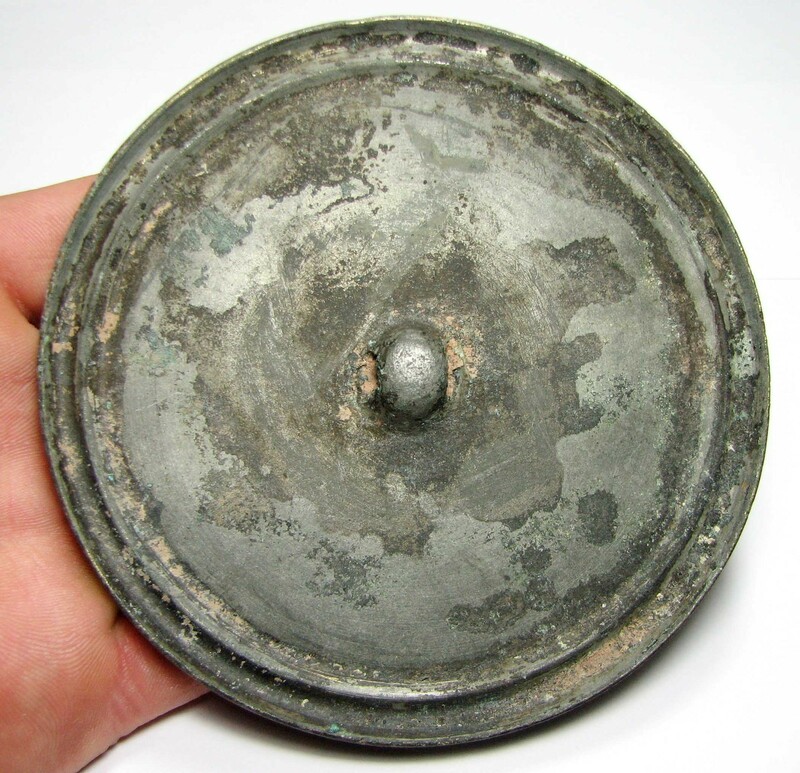 The bronze of these bells has a dark, almost black patina. The bells are used as horse bells (in Vietnam) and as a musical instrument (in Burma). 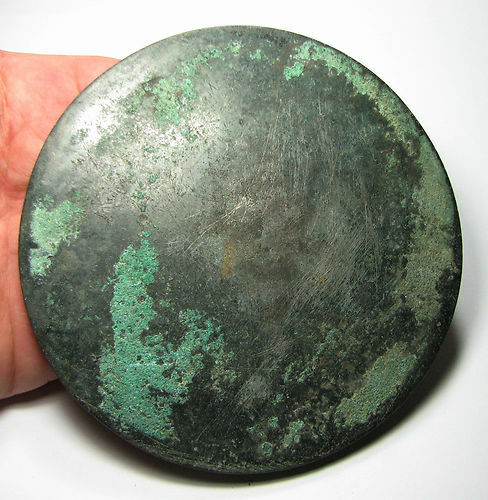 Any imperfections in a mirror’s surface were filled in with copper. 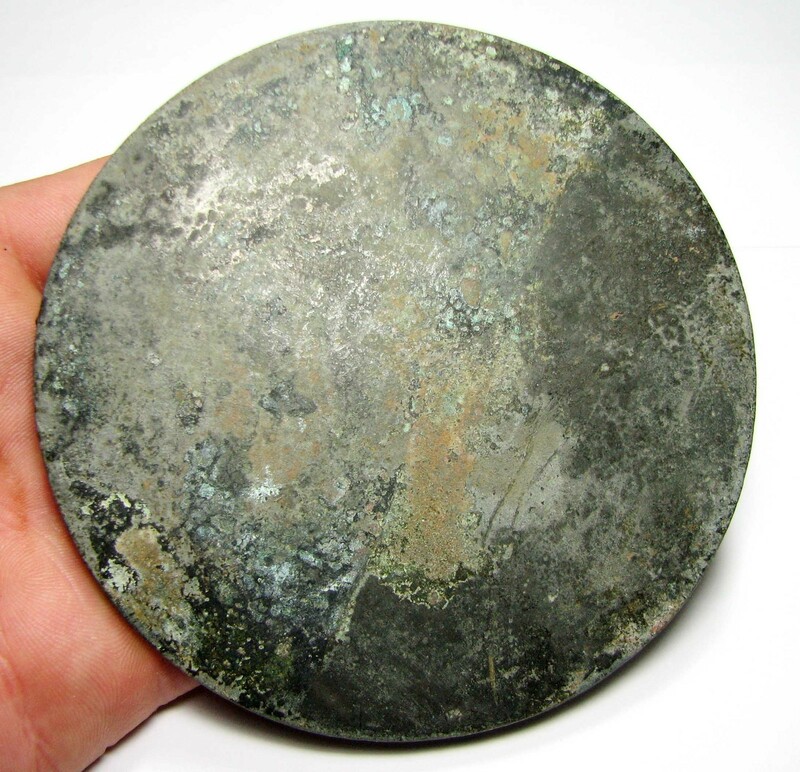 The entire surface of the mirror was then covered with a mercury amalgam that created a silvery, smooth reflective surface. 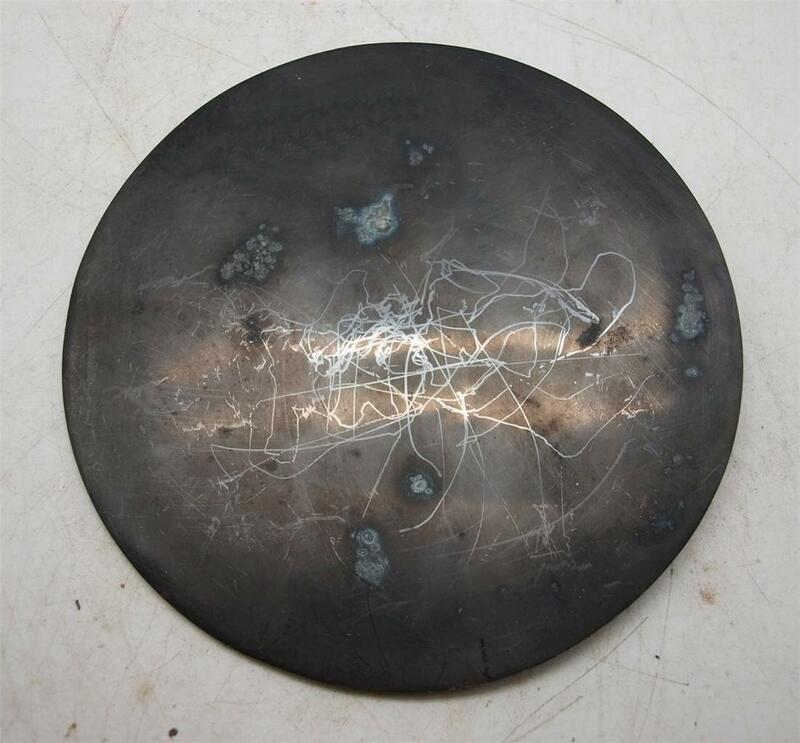 On these mirrors that surface has worn off in places and the copper has oxidised. The odd trace of rust is sometimes also seen, which may be due to the soil chemistry etc.